Brahmanand Sankhwalkar might not have won a World Cup like Dino Zoff when he was 40 years old but his career in Indian football was similarly long and highly productive. One of the first truly famous stars of Goan football, the ace goal-keeper was a pioneer in his own ways. He was also an integral part of the first great Goan club side and made invaluable contributions to rise of Goan football to its present status. Father William Robert Lyons introduced football in Goa in 1883 but Goa was never considered a force in Indian football till the 1970s. Vasco was the first major clubs to be set up in 1951 and was followed by Salgaocar and Dempo in next decade. Goan football really took off in 1960s when the state was integrated as part of India and their first chief minister Bandodkar used the game to garner popular support. Bandodkar even started an all-India level football tournament carrying his name, as big clubs from different parts of the country took part in it. On 6th March 1954 Brahmanand was born in Taleigao, near Panjim Goa. Brahmanand inherited his love for the game from his father Seguna Sankhwalkar. Family doctor Dr. Alvaro R Pinto also played an important role in turning his focus towards football. Dr. Pinto was a big football fan who would tell Brahmanand stories about world famous goal-keepers and show him basic football techniques when he still a child. In 1971 when he was still a teen-ager, Brahmanand got his first big break. His elder brother Vallabh was a player in Panvel Sports Club and an official of the same club Anthony Botelho asked him to find a make-shift ai?? ?keeper for the club as all their regular custodians were out injured. The occasion as a New Yearai??i? ?s Day feast match in Saligado. An elated Brahmanand turned up to play the match wearing his Progress High School uniform and his brotherai??i? ?s boots wrapped in a news-paper. He had often played as a forward in his school but did well in that match as a goalkeeper, despite his team losing 2-1. Two weeks later Panvel Club was still in a goal-keeper crisis as Brahmanand was drafted into the team after permission was sought from his school (with him being a minor). He made his debut in a league match against Goa Shipyard. Panvel took a quick 2-0 lead but a nervy Brahmanand, still inexperienced in set-pieces conceded two goals from corners. He soon picked up the pieces in second half, saving several shots as Panvel won 6-3. Panvel Club was a perfect opportunity for Brahmanand to hone his skills. At that time he was very young for a goal-keeper and had to balance his studies along with playing football. By playing in a low profile but encouraging outfit like Panvel Club he was able to develop slowly but steadily as a goal-keeper. During his time at the club he was also starting to show his leadership qualities for which he would later become famous. He finished in top-5 twice with Panvel in the league. In 1970 the Bandodkar trophy was started in Goa in order to popularize football through an all India tournament. It was in this tournament that Brahmanand would get his first piece of major success. In 1974 Panvel Club reached the final for first time in their history to face Sesa Goa. A 21 year old Brahmanand donned the captainai??i? ?s arm-band. Undaunted by the occasion he dished out a spotless performance at the back as Panvel Club eked out a 2-0 win to seal the first piece of major silverware in their history. Bigger clubs in Goa had already taken a notice of Brahmanandai??i? ?s talent as he was picked for Goa in Santosh Trophy in 1973. Dempo was the first one to make a move as they came close to signing him in 1973/74 season. However, he was dissuaded by Botelho and another club official Levino Dias. Their logic was sound ai??i?? Dempo had India international Sampat as well as E Cardozo in their squad and the young goal-keeper would lose some much needed playing time there. In ai?? 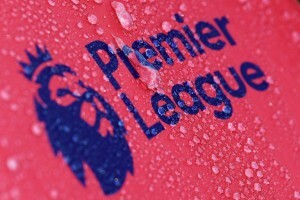 ?My Days with Goa Footballai??? in ai?? ?A History of Indian Footballai?? ?, Brahmanand wrote how thankful he was to those officials for not letting him make a mistake of choosing the wrong club at that time. His tryst with Panvel Club though lasted for just one more year as he joined Salgaocar in 1974. Salgaocar Sports Club was quite possibly the biggest name in Goan football in that era as they won the Goan first division title consecutively from 1960 to 1963. With four league titles in their name they were one of the most successful Goan clubs but had not won the title since 1966. Brahmanand tasted immediate success after signing for Salgaocar, winning his first league title in 1974/75 season. 1975 was a memorable year for Brahmanand when he was picked up to represent his country for Asian Youth Championship in Kuwait. Arun Ghosh had coached India to jointly winning the title with Iran in 1974 and he spotted Brahmanand, getting impressed by his reflexes. He was a starter for the junior national team as India was put in a strong group containing North Korea and South Yemen. India could win only one of their matches and was knocked out in the group stages. The Goan First Division League was not held for two seasons after Salgaocarai??i? ?s triumph for two seasons but returned in under the name of Goan Super League in 1977. The Goan Greens once again obliged, by defending their league title with Brahmanand in prime form. 1979 would be a pivotal year for Salgaocar and Brahmanand as T Shanmugham arrived at the club as coach. Dempo was dominating the league at that time and the Goan Greens needed a new direction which would be provided by the man who was part of Indiaai??i? ?s 1951 Asian Games Gold winning team. Brahmanand too, would reach his peak form under Shanmughamai??i? ?s tutelage as he became a regular for the Indian national team. The period between 1981 and 1985 well and truly belonged to Salgaocar with Brahmanand being unbeatable under the posts. They won the league title four times in five seasons with only the 1983/84 season being a blemish. There was considerable success in the Cup competitions as well with Salgaocar reaching three Bandodkar trophy finals, winning it in 1981 after defeating Vasco 3-0. This was also the period when Salgaocar first began to make their mark on national tournaments. Local rivals Dempo and Vasco had both excelled in Rovers Cup with the former winning it three times in second half of 1970s but Salgaocar had never really translated their state league form to major tournaments. That hoodoo finally broke in 1985 when they finished runners-up in Rovers Cup. In 1983/84 season Salgaocar traveled to Hyderabad to annex the Nehru Gold Cup. Nearing his 30s, Brahmanand was now entering a phaseAi? ?which is usually considered as the peak time for goal-keepers and he would play some of his best matches from 1983 onwards. The first half of the decade was memorable for him not just in terms of club football but also when he represented his state. He had reached his first Santosh Trophy final in 1979 when Goa narrowly lost to Bengal. Under his captaincy Goa was back in the final in 1983 after thrashing Karnataka 7-1 in semi-final. Playing in front of a hostile crowd in Calcutta, Brahmanand would deliver two of his most famous performances as he held out a very strong Bengal attacking line-up at bay for two consecutive 0-0 draws, helping Goa to win their first title jointly with Bengal. It must have been a tall order to better his performance of 1983 Santosh Trophy but Brahmanand managed to do the improbable in 1984. Goa was grouped with Karnataka, Tamil Nadu and Punjab which they topped after winning two out of three matches. A two legged semi-final with Kerala came next with Goa comfortably winning 1-0 and 5-0. In Madras Goa would win their first ever outright Santosh Trophy after a 1-0 win over Punjab. Remarkably, their captain Brahmanand Sakhwalkar had not conceded a single goal in entire tournament, keeping clean-sheets for 576 minutes, a record till date. After gaining a strong foothold in domestic league, Salgaocar launched themselves onto the national scene in second half of 1980s, with immediate success. The Goan Greens won a number of titles but their favourite tournament was Federation Cup, Indian version of the FA Cup. Started in 1977, no Goan team had managed to win the tournament but Salgaocar became the first club from Goa to reach the final in 1987. But they faced the kings of Fed Cup Mohun Bagan and lost 2-0. In 1988 Salgaocar won their first piece of major Cup silverware in Indian football when they dispatched local favourites Border Security Force in the final in Delhi. Brahmanand played a difficult game against the rugged army-men as Mario Soares struck the match winning goal. The same year Salgaocar created more historyAi? ?by becoming the first Goan club to win Sait Nagjee Trophy after defeating Mohammedan SC. A hattrick of Federation Cup finals was achieved in 1989 and Salgaocar became the first team from outside Bengal to successfully defend their Fed Cup title. Playing in front of 21,000 people in Coimbatore the final against Mohammedan SC finished 0-0 in normal time but two goals in extra-time ensured the Greens took their second title home. Brahmanand had also kept clean-sheets in back to back Fed Cup finals. The following year Salgaocar touched Mohun Baganai??i? ?s record of reaching four consecutive Fed Cup finals but failed to complete their hattrick of victories, falling to a legendary Kerala Police side in the final. In 1989/90 season Salgaocar won their first Rovers Cup title after beating Dempo in the final as Brahmanand kept yet another clean-sheet. In 1991 Brahmanandai??i? ?s long and remarkable 17 year tenure with Salgaocar came to an end. In Indian football it was a unique feat as goal-keepers rarely play in one club for lengthy periods. Remarkably, he didnai??i? ?t retire for football though he was 40 years old. Instead, he joined the rising force in Goan football ai??i?? Churchill Brothers. After a four year stint with Churchill Brothers he played two seasons with his village club Anderson Mariners before calling curtains on his incredible 25 year long career in 1995. Interestingly, when the National Football League started a year later Goan clubs yet again approached him to break his retirement! Like his club career, Brahmanandai??i? ?s bond with the national team also lasted for multiple decades. He started with the 1975 Asian Youth Championship and played one more youth championship in 1976. In 1976 and 1977 he was part of the Indian team for Marah Alim Cup in Kabul, Afghanistan. He played his first Merdeka Cup in 1976 and was part of the Indian squad for three subsequent editions in 1981, 1982 and 1986. There were other tournaments in the Far East in which he participated ai??i?? Kingai??i? ?s Cup, Bangkok (1977) and Presidentai??i? ?s Cup in Seoul (1977, 1982). In winter 1977 an Indian team went to Zambia on a Goodwill Tour, going to Kitwe, Ndola and Lusaka. India played three matches, winning one of them 2-1. His performance in Indiaai??i? ?s victory was praised by Zambia Times at that time which branded him as a ai???Leopardai???. Brahmanand also represented India in other exposure trips to Moscow (1983 and 1986), Indonesia (1980), UAE and Bahrain (1979). In 1983 he was Indian captain for the second Nehru Gold Cup and retained the arm-band till 1986. He participated in two more Nehru Cups in 1985 and 1986. In 1982 India reached the first knock-out rounds of Asian Games and Brahmanand was back-up to Bhaskar Ganguly in that tournament. He represented India in 1986 Asian Games as well. In his era Brahmanand was a regular pick for Indian squads. However, he had to compete with the brilliant Bhaskar Ganguly for a starting spot. With Bengal players often getting more preference the Goan ai?? ?keeper may not have got as many starts as he deserved but still made over 50 appearances for the national team, a significant number in those days. Brahmanand is a highly qualified coach, having completed the AFC A, B & C license exams but has focused more on youth development with SESA Academy. He was the national team coach for goal-keepers from 1997 till 2005. He has received several awards for his distinguished career, winning Bakshi Bahaddar Jivbadada Kerkar Award in 1977 and another state award in 1986. In 1996 he was selected as AIFFai??i? ?s player of the decade for 1985-1995 decade. 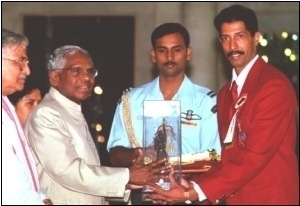 His biggest award came on 29th August 1998 when he became the first footballer from Goa to receive the Arjuna award.